Nobility Crest, which is in Ocean Township, is an active adult community. Nobility Crest is an exclusive, 55+ community for people who want luxury, value and a great location. Located on Route 66 in the Wayside section of Ocean Township, Monmouth County, NJ, New York City and Atlantic City are about a 1 hour drive. The Jersey Shore beaches are minutes away. Because of the easy access to the Garden State Parkway, Route 35, Route 66, Route 33 and Route 195, make community is an excellent choice for frequent travelers. Nobility Crest is close to shopping malls, theaters, libraries, museums, and much more. Originally, four buildings were planned, however, only three were built. While a new builder is trying to erect the fourth, and final, building, we have no further information. There are 198 single upscale single level homes which are located in three mid-rise buildings with hotel-like common areas. Included are elevators between floors and secure, underground parking. Homes feature 2 bedrooms, gourmet kitchens, cozy dens, large living and dining areas, in addition to large expansive balconies. Third floor penthouse homes also offer a loft. Items that are upgrades in most communities are standard such as granite counter tops in kitchens and baths and hardwood flooring. Furthermore, these homes sell from the low $300,000s to the mid $400,000s. In Nobility Crest, there is a 4,300 square foot clubhouse which has a fitness center, business center, lounge, billiard and card rooms. And the heated outdoor pool has a walk in ramp, thus providing easy entry. In addition, each building’s lobby also serves as common recreation space. One building houses the library, another the movie theater. 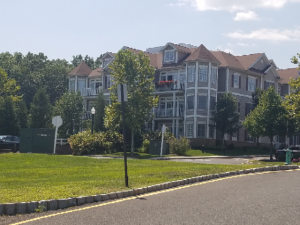 Call today to see the active adult community homes for sale in Nobility Crest, Ocean Township NJ.